A simple list of easy meals to make on vacation. When you are thinking about beach vacation meal planning these crock pot meals will help make your time in the kitchen short when you are trying to put together vacation meals on a budget. You want to eat delicious food but don’t want to spend hours in the kitchen like you do at home. 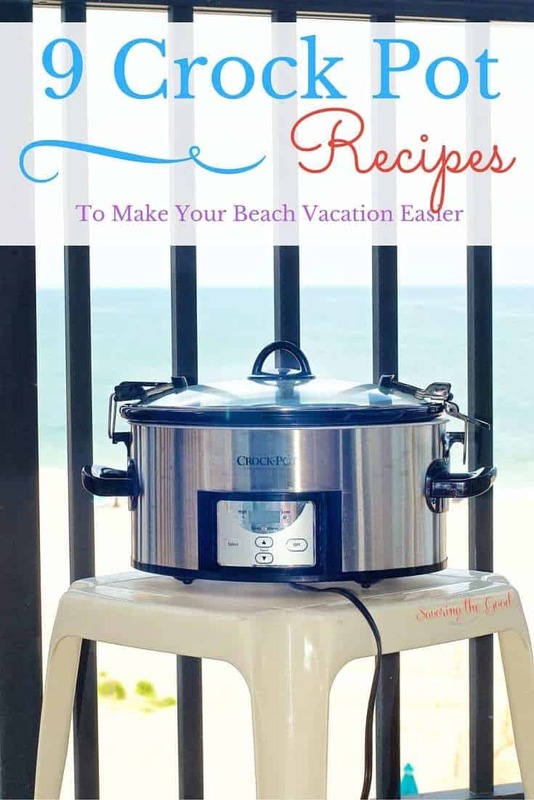 These beach crockpot meals will keep your hand out of the kitchen and your toes in the sand! It is vacation time! You have booked that beautiful house, condo or bungalow by the beach and you are planning your meal prep. Vacation should mean eating delicious food but not wanting to spend hours in the kitchen like you do at home. Don’t be the person who has to stays back at the vacation rental chopping, cooking and cleaning up while everyone else is basking in the sun, jumping in the waves or reading their favorite novel by the pool. Pack your trusty Crock Pot Slow Cooker and grab the ingredients for a few of these recipes and you are all set! Fill the crock pot in the morning (or night before depending on the recipe) and you let the crockpot do the work for you! Now go pour yourself a glass of wine, water, beer or cocktail! You deserve it. No need to heat up your oven when you make this easy recipe for crock-pot lasagna. This slow cooker lasagna recipe is my go to meal for potlucks or a busy weeknight meal. No longer worry about clean up after baking a lasagna in the oven because this crock-pot lasagna cooks self contained and there is no spill over. This delicious soup can be put together in less than 45 minutes from start to finish or you can use a little help from your crockpot and allow it to take all day for the flavors to fully develop and mature. An easy slow cooker breakfast meal is crockpot hash brown egg casserole. This simple breakfast casserole recipe has frozen hash browns, crumbled browned sausage, eggs and cheese. This crockpot casserole contains cream of mushroom soup and can be customized to meet your families favorite flavors. This crockpot Mexican corn soup has layers of flavor that include shredded chicken, black beans, creamed corn, Mexican spices as well as a creamy broth. Top this easy slow cooker soup with your choice of fresh squeezed lime, avocado, cilantro, sour cream and jalapeño. Crockpot Mexican corn and chicken soup is sure to bring your favorite fiesta flavors to your table. This is my interpretation of a copy cat recipe because no matter how hard I try, I can not make carnitas as well as the good folks at Chipotle. I think it is pretty close… Close enough for me to curb that craving until I can get across town and have an official carnitas bowl. One of the comfort foods of my youth are stuffed cabbage rolls, also called Halupki. This is my family's cabbage roll recipe and you will be surprised how easy they are to make. This is the ultimate comfort food from the old country. This is our family's pizza casserole recipe. My kids loved to have this casserole when they would visit their grandfather. Simple ingredients make a comfort food that everyone loves. Plus you might want to search through these recipes to see if any of them will make your beach vacation a bit more tasty! This post was originally post in July 2016. What a great idea . . .I NEVER thought of brining the crock pot . . . THANK YOU! We are heading to the beach for spring break and I didn’t want to spend all my time in the kitchen. This list will help keep me on the beach and out of the kitchen.